My daughter Phoebe is 19 weeks old today and is exclusively breastfed. This is a statement I never thought I'd make, let alone be proud of making it! If I'm honest, I was completely open to either breastfeeding or formula feeding my baby during my pregnancy. However, as I neared my due date, I began to feel a strong motherly urge to try and nurture my little one in the most natural way. To me, and many other mums, this is breastfeeding. So I made the conscious decision to 'try' and breastfeed Phoebe as long as she and I were both happy and healthy. I never put a targeted time frame on this decision because I was beginning this journey with no expectations and little knowledge about breastfeeding. I am one of the first in my family and friend group to have a baby, so have had little to compare myself to - and I like it like that! I found this was especially beneficial to me as I embarked on my breastfeeding journey. Nothing really prepares you for just how hard breastfeeding can be. There is so much emphasis on how 'natural' it is, and although this may be true, it definitely doesn't inform mothers of what struggles they may face. I chose not to read too much information on breastfeeding as I wanted to just take each day as it came and 'see how we got on.' I decided that if it got to the stage were I was too distressed or Phoebe wasn't gaining enough weight; we would stop. Thankfully, this was never the case. Though, it certainly was close at times! In those precious first few days, Phoebe was more interested in sleeping, rather than feeding! So often she would fall asleep at the breast and I just knew she wasn't getting enough food. She was a hefty girl (9lbs,11) when she emerged via c-section, (a whole other blog post!) so I knew she would want plenty of milk. I will never forget that 'dreaded' day 5 (postpartum). Phoebe was crying for food, yet would not settle at the breast, so I tried to express. I had one little bottle and no pump, so I stood over the sink in the bathroom, hand expressing into this bottle as quickly as I could. It was midnight. After each 20 minutes, when my back could take it no longer, I would rush into my husband who would feed Phoebe, then I would frantically rush back to the bathroom and pump like crazy again. For almost two hours I pumped, for almost two hours I bent over that sink feeling like a cow being milked! By the way, all that bending and pumping was not good for a very sore c-section wound!! Yet, we made it ... we made it to day 6 and things began to get easier and feel more natural. Don't get me wrong, from that day on, things have not been smooth sailing with regard to breastfeeding. Yet, I am so thankful that we are continuing in our breastfeeding journey today, despite the ups and downs. Yes, there have been tears. My right breast at times has been excruciatingly painful while Phoebe has been feeding. So much so, that for 2 weeks I had to express milk and feed Phoebe from a bottle and the other breast solely. I remember tentatively trying to get Phoebe to latch on again after those 2 weeks and tensing up, toes curling, ready to wince at the pain ... and nothing! I remember my utter delight at another breastfeeding hurdle jumped! Another challenge conquered! It is most definitely not easy choosing to breastfeed. Feeding on demand is not convenient and it usually means being late somewhere or not going at all sometimes. You have got to stick at it, even when you feel like giving up, and push on and through because once you get to the other side ... breastfeeding your baby can be totally beautiful. The closeness and bond between mama and baby is like nothing I can describe. I feel wholly connected to Phoebe and enjoy nursing more than I ever imagined I could. It forces me to stop and take time. Time I otherwise wouldn't take for myself and my daughter. Time to rest and reflect on all that it means to be a mother. Time to wish that this time would go more slowly. I already feel the very real fear of when that time comes to wean my girl off the breast. The end of my maternity leave is looming ever closer and I worry about my ability to express enough milk and whether it would just be easier to have Phoebe on the bottle by then. That very thought makes my heart sad. Yet when all is said and done I hold my head high and be proud that we have come this far. At present, Phoebe loves to nurse, and so do I. For now, we will enjoy the moment. In our boutique, we stock a selection of stylish necklaces handmade by Rachel at Chewable Charm. Primarily they are teething necklaces; you gorgeous mamas wear them and your sweet littles can safely chew away to soothe their wee gums. But I have found that they are also great for nursing mums too! They serve as a super distraction from hair pulling and baby checking out the surroundings while nursing. They are a fab tactile and visual stimulus. Phoebe loves twiddling away on mine while happily nursing! 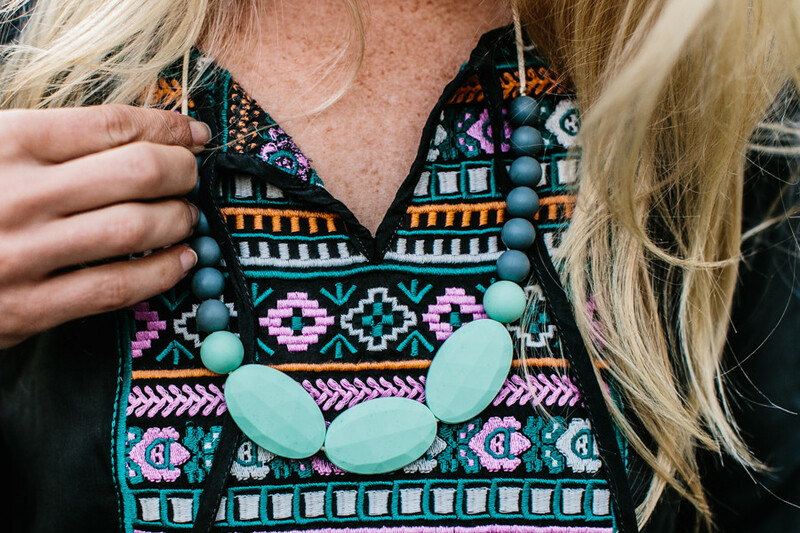 We do have limited stock of these necklaces so if they take your fancy, order one today! I absolutely adore mine ... they are totally practical and right on trend for all you fashion conscious mamas out there!